Easter commemorates the victory of Christ over every worldly evil including sin and death. His resurrection from the dead placed the seal of divinity upon His teachings. That is why at Easter time the Church sings with joy and gladness. How proud you should be to profess your faith; to live it; to generously support it and help bring it to others. 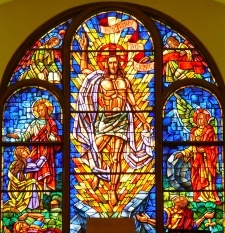 May the glory of our Risen Savior bring to you and yours peace, happiness and spiritual contentment!